A tip, or gratuity, is money given by a customer to an employee for service provided to the customer. While the vast majority of wage issues regarding tips involve restaurant and hotel workers, tipped employees can include hairdressers, aestheticians, car wash attendants, golf or tennis instructors, valet parking attendants, doorpersons, and more. Refusing to fully compensate tipped employees is a form of wage theft. If you receive tips as part of your compensation, a number of specific state and federal wage and hour laws protect you, in addition to those that protect all workers. At the federal level, the Fair Labor Standards Act (FLSA) protects tipped workers, while at the state level, New York Labor Law § 196-d and the New York Department of Labor Hospitality Industry Wage Order (12 NYCRR § 146) apply to tipped employees. A New York employment lawyer can help protect your rights. Employees who receive tips, by law, must receive at least the minimum wage for all hours worked. If the employee’s tips do not equal minimum wage, the employer is legally obligated to make up the difference. Tips are the property of the employee––employers are prohibited from using their employees’ tips except in a valid tip pool or as a tip credit. You cannot waive any of these rights, even if you sign an agreement with the employer. Such an agreement would not be valid. A New York employment lawyer can help you recover back wages and penalties if your rights have been violated. If you don’t earn enough in tips during a given shift to bring your hourly compensation up to the minimum wage, your employer has to pay the difference. On the other hand, even if you make the minimum per hour in tips alone, your employer still has to pay you the minimum cash wage. Your employer is not allowed to pay you solely with tips. There are exceptions to the tip credit rules. If you perform non-tipped work for more than 2 hours OR more than 20% of your shift, whichever is less, the employer cannot take the tip credit for any hours you worked that day. Non-tipped work includes jobs like washing dishes or preparing food. However, any work that is customarily and regularly performed in the industry by tipped employees will not be counted as non-tipped work. Trainees, learners, or apprentices must also be paid in accordance with the wage chart. Before you begin working, your employer must provide written notice of the amount of tip credit that will be taken from your minimum hourly rate. The notice must also state that extra pay is required if your tips are not enough to bring your hourly rate up to the minimum wage. Your employer must record the tip credit on a weekly basis as a separate item in the payroll record. Tips belong to the employees, not the employer. Your employer cannot require you to give any part of your tips to the restaurant. However, your employer can require that tipped employees pool their tips. Tipped employees also may voluntarily choose to create a tip pool. Tip pooling requires tipped employees to chip in all or a portion of their tips, which are then divided among certain employees. The employer, including managers, can never be part of the tip pool. A valid tip pool also should not include employees who typically don’t receive their own tips, like dishwashers. When determining the amount of the tip credit, your employer can only count the tips that you actually receive from the tip pool, not the amount that you contributed to the pool. For example, if you made $100 in tips and put that in the pool, but only received $80 after tips were distributed, your employer can only count the $80 in determining the amount of the tip credit. Some restaurants and most event venues add a “mandatory service charge” onto bills for large groups, private parties, or catered events. Customers often assume that these service charges act as a tip or gratuity for service. However, if the restaurant does not intend to distribute the charge to service employees as a tip, it must clearly notify customers that the charge is administrative and not a tip or gratuity for the servers. If the restaurant does not make this crystal clear to customers, using specific language, the service charge will legally be considered a tip and must be distributed to employees. Charles Joseph, a New York employment lawyer with decades of experience, has led the fight against illegal service charges. Many customers put service tips on their credit cards, and many credit card companies charge a processing fee. Employers are legally allowed to subtract an amount proportionate to the processing fee from the designated tip in order to pay the fee. Your employer is required to pay all tips given by customers via credit card no later the next regularly scheduled payday. Tipped employees are covered by overtime pay laws. If you work overtime – more than 40 hours in a workweek – you must receive overtime pay, which is at least one and a half times your regular rate of pay. Even if your employer pays you less than minimum wage by using a tip credit, your regular rate of pay will be calculated based on the full minimum wage. In addition, most employers are required to give employees at least one day off each week, with a few exceptions, for example seasonal resorts. However, employees can volunteer to work overtime. New York law requires that your employer pay you an additional one hour of pay at the standard minimum wage if you work more than ten hours in a single workday. This is known as spread-of-hours pay. The ten hour spread includes any breaks or meal periods that occur during the workday. Your employer may not use the tip credit to reduce the hourly rate for spread-of-hours pay. However, this extra hour of pay does not count when calculating hours worked to see whether you are entitled to overtime. If you work a split shift – where your hours worked are not consecutive – you are also owed one additional hour of pay. For example, if you work from noon to three and then return to work from seven until midnight, you must receive pay for the eight hours of work plus an additional hour at minimum wage. You must be paid for all hours that you are working. Employers are required to pay employees for so-called “off-the-clock” work. This can include setting up the restaurant before your shift officially begins, staying after your shift to complete tasks that your manager believes should have been finished during the shift, and undergoing mandatory training during your personal time. Employees must receive pay for off-the-clock hours. Tipped employees are eligible for call-in pay. Employees who report to work for a regularly scheduled shift only to learn that their shift has been cancelled are entitled to receive call-in pay. If you were scheduled for one shift, your employer must pay for three hours, or the number of hours in the scheduled shift, whichever is less. If you were scheduled to work two shifts of six hours or less total, you should receive pay for six hours or the number of hours in the scheduled shifts, whichever is less. Finally, if you were scheduled for three shifts of eight hours or less total, you must receive pay for eight hours or the number of hours in the scheduled shifts, whichever is less. In New York state, employers are required to pay for uniforms. If you are required to wear a uniform that cannot be worn as part of your ordinary wardrobe, your employer must pay for the uniform or reimburse you for the cost no later than your next regularly scheduled paycheck. In addition, your employer must pay for the laundering and maintenance of that uniform. If you have to launder it yourself, your employer must pay you a weekly amount to cover the cost, which is based on the number of hours you work. However, employers do not have to pay laundering costs if the uniform is “wash and wear,” meaning it can be routinely washed with other clothing and does not have any special cleaning or ironing requirements. Under New York state law, employees are entitled to meal breaks. Employees are entitled to a half-hour lunch break when they work a shift of more than six hours that includes the period between 11:00 a.m. and 2:00 p.m. If the shift starts before 11:00 a.m. and ends after 7:00 p.m., employees are entitled to another 20-minute break between 5:00 p.m. and 7:00 p.m.
Employees who work a shift of more than six hours that starts between 1:00 p.m. and 6:00 a.m are entitled to a 45-minute break in the middle of their shifts. You may be entitled to paid meal breaks. Employers are required to pay for breaks if you have to perform any work during the break time. This can include checking work emails or answering phone calls. However, if you do not have to do any work, meal breaks are unpaid. Employers can require workers to remain on site during meal breaks. In addition to meal breaks, employers may choose to provide shorter five to twenty minute breaks throughout the workday. If your employer offers short breaks, they are considered part of the workday and employees will be paid for this time. When employers provide workers with meals on the job, those meals may be considered part of your wages. Employers can take a meal credit out of your wages. There are a number of rules regarding how tipped employees are paid. Manual workers, which include waitstaff, must be paid weekly, and not later than seven calendar days after the end of the week in which the wages were earned. If you leave your job, either voluntarily or involuntarily, you are entitled to be paid no later than the next regularly scheduled payday. Your employer can mail you your last check, but that must be at your request. The employer must put the check in the mail early enough that you receive it on or before your next payday. It is against the law for your employer to request any part of your wages under the threat of not hiring or firing you. This also includes requesting any other thing of value. Employers are not required to provide fringe benefits. Employers are not under a legal obligation to provide fringe benefits such as vacation pay or employer-provided health insurance. However, if your employer has promised to provide any of these benefits, they are legally required to honor that promise. Employers are required to keep payroll records. Your employer is required to keep extensive payroll records for each employee, for at least six years. It is the employer’s responsibility to keep these records. If you file a complaint claiming that your employer failed to pay you in accordance with the law, your employer must provide copies of these records. If your employer has not kept adequate records, the burden of proof shifts to the employer, who must prove that you were paid what you are owed. In the absence of these records, your calculations of what you are owed do not have to be exact or precise. The agency or court handling the complaint can grant back pay. Your employer is not allowed to make any deductions from your paycheck unless it is required by law, such as income taxes or Social Security taxes, or it is for your benefit, such as health insurance, pension contributions, discounted parking passes, fitness center dues, or daycare expenses. In all other cases, your employer must have your agreement in writing before taking deductions from your wages. Tipped employees are legally protected from employer retaliation. If you have complained to your employer, filed a complaint for wage-hour violations, or provided information in any investigation, it is illegal for your employer to take any retaliatory action against you based on that activity. You are protected even if you are no longer an employee, and regardless of whether your complaint was oral or in writing. Employers are also legally barred from retaliating against employees they suspect of making complaints. Your employer cannot discharge, threaten, or penalize you in any way, including lowering your rate of pay, assigning you less desirable job duties or shifts, reducing your hours, or demoting you. If your employer has retaliated against you, you can file a lawsuit for relief, including reinstatement of your job and payment of lost wages. You may also be eligible for “front pay,” which is the amount of money necessary to make up for the difference in pay that you would have earned in the future if not for the retaliation. The law also provides for liquidated or “double damages” up to $20,000. Courts have the power to order the retaliation to stop immediately. You have two years to file a claim for retaliation. 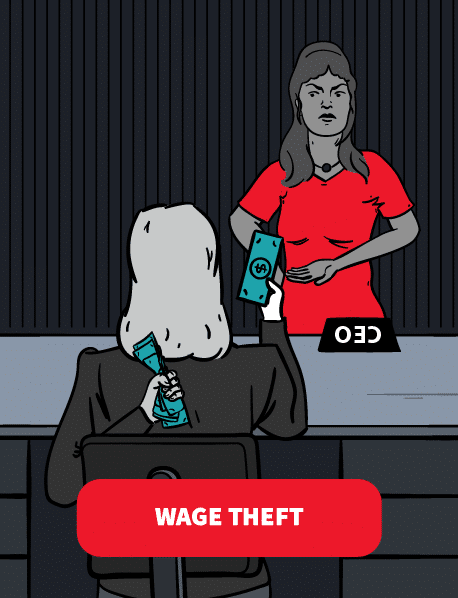 Tipped employees have several options if they have been the victims of wage theft or other illegal conduct by their employers.